Share the Easter holiday with your little loved ones by sending this playful Easter Basket! Warm their hearts with everything that makes Easter special. 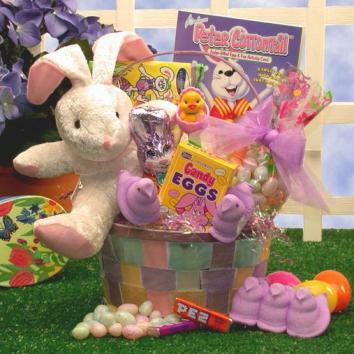 This gift includes the following: A plush Easter bunny, marshmallow Peeps, jelly bird Easter eggs, Easter pez dispenser w/ pez candy, foil wrapped milk chocolate crisp bunny, Eater candy mix, Peter Cottontail activity book w/ fudge filled chocolate Easter egg, all in a pastel Easter basket.